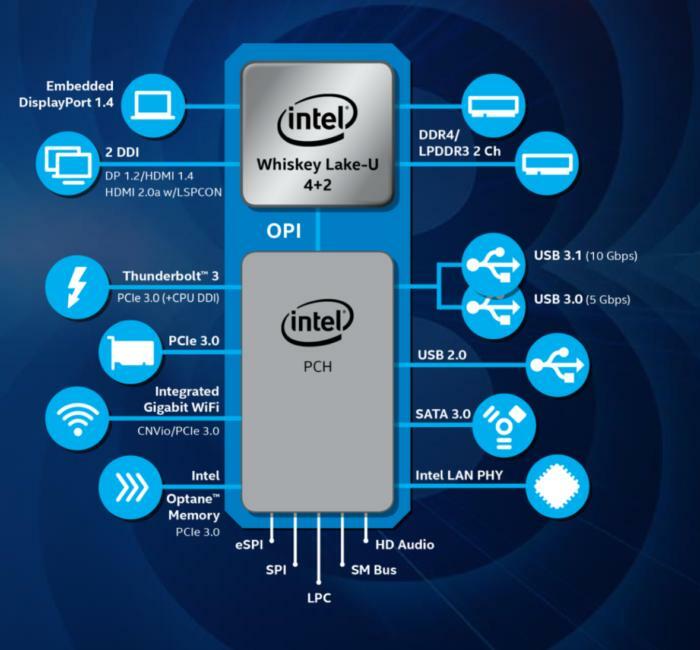 Intel's latest Core chips, Whiskey Lake for laptops and Amber Lake for two-in-ones and tablets, will highlight Intel's Gigabit Wi-Fi as part of custom branding for its 8th-gen parts. While Intel’s new Whiskey Lake and Amber Lake mobile Core chips differ from their predecessors mainly in terms of available boost speed, Intel’s marketing spin will emphasize something else: Notebooks and tablets sold with these new 8th-gen U- and Y-series chips will be labeled as "optimized for connectivity." Expect to see the first announcements this week at the IFA show in Berlin, Germany. The first Whiskey Lake notebooks and Amber Lake 2-in-1s could ship as early as September. Rather than pitch the new processors as simply faster, Intel’s messaging—including the stickers that will ship into notebook PCs—will emphasize the Gigabit Wi-Fi connectivity Intel built into its six new chips. That may be because Intel’s chips are simply becoming harder to tell apart. These new 14nm Core chips are essentially the third iteration of the original Skylake 14nm processor, though Intel has shipped 14nm chips since 2014’s “Broadwell” generation. Here’s the number that matters, though: Intel is promising that Whiskey Lake/Amber Lake will deliver a 10-percent generational improvement in performance over the most recent Kaby Lake-R 8th-gen chips, and that Whiskey Lake is half again as fast as a 7th-generation Core chip. The story behind the story: Intel’s marketing follows a consistent pattern: When the company’s CPU trounces the competition, you’ll hear a lot of noise around clock speed, cores, and performance. When Intel’s less sure of itself, talk turns to platform-level improvements surfaces. In 2000, when Transmeta thrust low-power microprocessors into the spotlight, Intel’s Centrino messaging was all about its combination of processor, chipset and wireless. Intel isn’t feeling quite the same pressure from AMD, but the emphasis on Wi-Fi today is a tell that it’s still sensitive. Intel says that the new 8th-gen Core chips will emphasize connectivity, as per the tag line that will appear on Intel logos and branding for the new Whiskey Lake chips. For now, there are three processors in Intel’s U-series (Whiskey Lake) family, and three in the Y-series (Amber Lake) family. Expect to see the 15-watt U-series chips in thin-and-light and conventional laptops, while the 5-watt Y-series chips will be reserved for two-in-ones and tablets, especially fanless versions. All of the Whiskey Lake and Amber Lake chips include Hyper-Threading, maxing out at 4 cores. The new chips include: the 1.8GHz Core i7-8656U, the 1.6GHz Core i5-8265U, and the 2.1GHz Core i3-8145U. In addition, the Y-series includes the 1.5GHz Core i7-8500Y, the 1.3GHz Core i5-8200Y, and the 1.1GHz Core m3-8100Y. The Whiskey Lake cores will integrate Intel’s HD620 GPU, executives said. Intel is offering six new chips, three each in the U-series (Whiskey Lake) and Y-series (Amber Lake) families. Don’t expect Intel’s marketing to push generation-over-generation comparisons, however. Instead, there’s a familiar refrain: Intel wants you to compare the performance of Whiskey Lake to five-year old PCs—in other words, the PC you might currently be using, which Intel hopes you'll consider replacing. For example, given the task of creating a 4K video, Intel says Whiskey Lake is up to 6.5 times faster than a five-year-old PC; editing in Adobe Lightroom can be performed up to 2.9X faster, and "back up and upload" of content can be performed 12 times faster than a five-year-old 802.11n modem, taking advantage of the Gigabit Wi-Fi capability. In another year, the comparisons to the “5-year-old PC” will be to Intel’s first 14nm parts. Gameplay will be twice as fast, Intel says, using the same metric. Intel also believes that battery life on Whiskey Lake platforms can be up to 14 hours, though that assumes the presence of a new, 1-watt display panel that will be rolling out this fall. Does AMD have an opening? Intel’s manufacturing monotony is starting to arouse attention on Wall Street. Intel is struggling to move from 14nm to 10nm with its Cannon Lake architecture. Meanwhile, supposed underdog AMD has been shouting its roadmap from the rooftops since January, including a planned shift to 7nm in 2019 (On Monday, AMD announced its was shifting its leading-edge manufacturing over to TSMC.). It's hard to see how much longer Intel can sustain a position of near-inertia. "Their process technology disadvantage, which I think is broken, will take five, six, seven years [to fix]," Rosenblatt Securities' Hans Mosesmann, who has covered Intel since the late 1990s, told CNBC on Friday. "I don’t think that [Intel’s] business model works by them being behind by a year or two in terms of process technology." Nevertheless, Chris Walker, the vice president who runs the Mobility Client Platform for Intel’s Client Computing Group, said that Intel has eked out 70-percent performance gains across the whole of its 14nm generation. 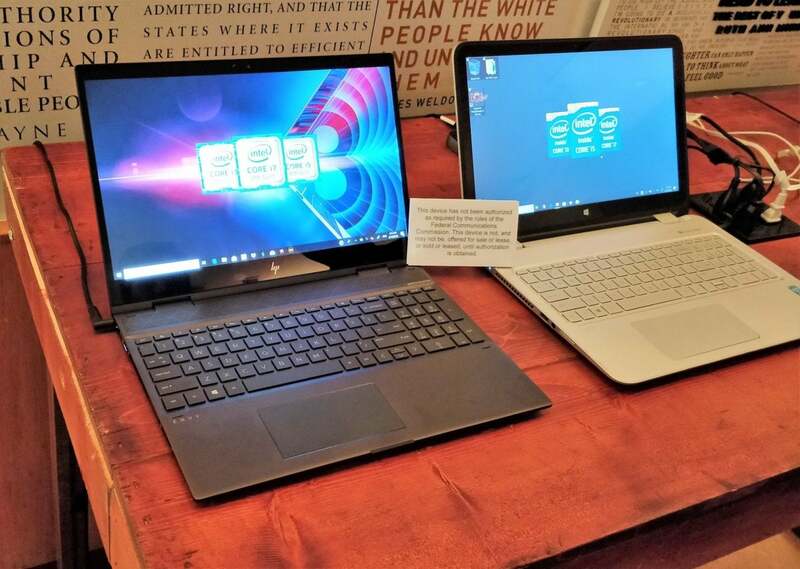 A pair of HP Envy laptops will use Intel’s new Whiskey Lake 8th-gen chips. Walker returned, though, to the type of performance users will see via the company’s gigabit Wi-Fi. "That's the kind of thing people are going to feel on an old computer," he said of the wireless performance differences between the old and new platforms. 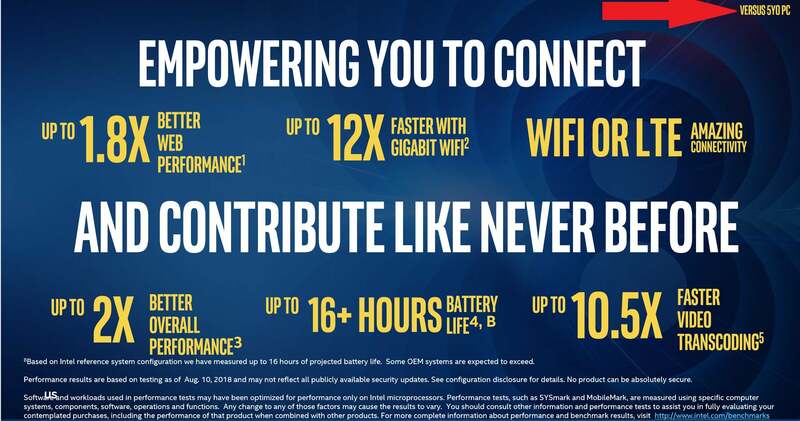 Intel’s Gigabit Wi-Fi, also known as Intel Wireless-AC 160MHz, will be matched with a few systems that include LTE connectivity at launch, with more due later this year, according to Karin Regis, director of notebook platform marketing with Intel’s CCG. Meanwhile, more and more ISVs are at least offering gigabit services to the home, and several consumer routers from companies like Netgear are supporting gigabit Wi-Fi, for prices under $200, she said. Regis didn’t say too much about the specifics of the Whiskey Lake-U platform, though a chip diagram that Intel published shows some details: Thunderbolt 3 will be included, as well as support for DDR4/LPDDR3, embedded DisplayPort, and more. The platform will also support Intel’s Optane Memory. Some of the capabilities of the Intel “Whiskey Lake” platform include Thunderbolt 3 and DDR4 memory. Intel also added a new quad-core audio DSP, designed to be used in conjunction with far-field mics on laptops. Though Windows 10 has included the Cortana digital assistant since its inception, Amazon and Microsoft have finalized their partnership to put Alexa on to Windows PCs, as well. All of these platform improvements will go hand-in-hand with the modest performance gains, and the more profound improvements in battery life that the new, 1W panel technology will achieve. One question stands out: Intel didn’t say much about Amber Lake, but low-power, fanless tablets have struggled to meet performance expectations. Whiskey Lake doesn’t appear to offer much in the way of excitement, but could Amber Lake stand out as a low-power, fanless alternative to notebooks? We’ll have to wait a month or two to find out.